Apricot trees (Prunus armeniaca) grow throughout Australia. Mature trees range from 23 to 40 feet tall. The fruit ripens from December to January; these small stone fruits combine a sweet and tart taste that is more tart when eaten fresh and grows sweeter when the fruit gets cooked. 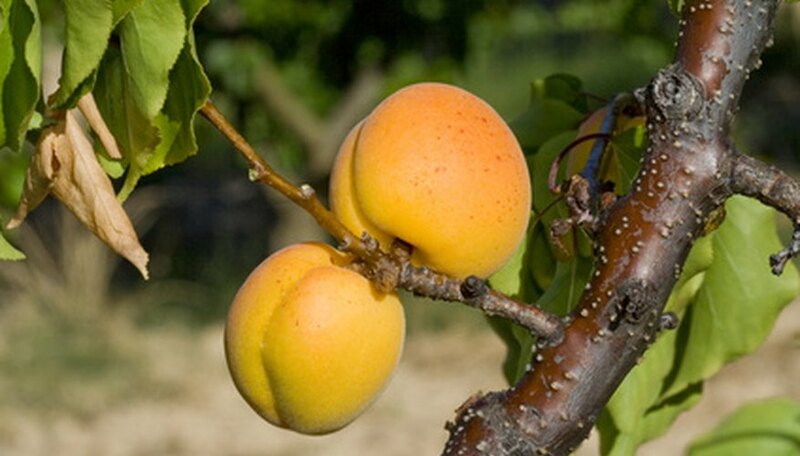 Australian gardeners should prune apricot trees during the summer after they harvest the fruit. Pruning keeps the tree healthy, promotes the growth of new fruiting wood and allows gardeners to manage the size. Note any dead, diseased and damaged branches on your apricot tree; these need to be removed for the overall tree health. Dead branches feel hollow and don't move in the wind, while diseased or damaged branches may be broken, bent, discolored or marred with growths. Prepare a solution of 1 part bleach to 10 parts water in a bucket, then place your pruning tools in the bucket. Remove the dead, damaged and diseased wood by cutting it off at its base. Discard all dead and unhealthy wood in the garbage bin. After every cut, dip your pruners in the bleach solution so you don't spread disease to healthy parts of the tree. Prune suckers from the base of the apricot tree as well as from the site of old pruning cuts. Suckers have lots of foliage and grow very fast but will never produce fruit. Remove branches that crisscross other branches, plus low-growing branches that impede movement under the apricot tree. Thin out the tree canopy by removing old, unproductive branches that bore few to no fruit. This promotes the growth of new fruiting wood. Head back long branches with your pruning shears to promote the growth of lateral branching. Work one branch at a time and clip them back at a 45-degree angle. Use lopping shears for cuts thicker than 1 inch and pruning shears for smaller cuts.